It is the bridegroom's privilege, and usually his happiness, to present the wedding bouquets to his bride, the bridesmaids, the bride's, mother, his own mother, and also buttonholes for the pages, if there are any. A certain amount of generous liberality is expected of happy bridegrooms. Parsimony, economy even, in his expenditure upon the wedding is considered inopportune. The florist will not indicate the lowest-priced bouquets to begin with, but a little gentle management will succeed in indicating that moderate charges are preferred. They are necessary in many cases. The bridegroom's "poverty, not his will, consents " to his providing the bride with something less exquisite and costly than he feels to be appropriate. And there are other bridegrooms, not always shallow-pursed, who choose the cheapest from mere habit - lifelong habit. The bridal bouquet, in the well-to-do classes, is usually made of choice exotics, and costs from one guinea to several. For the sum named a very pretty bouquet may be had, especially in summer, when so many white flowers are plentiful. All must be white, the only colour permissible being that of the foliage of the various flowers. A lovely bouquet may be composed of roses, tulips - their wonderful grey-green, spear-like leaves only a little less beautiful than the snowy petals - carnations, and the indispensable sprig of white heather, supposed to bring good luck in the shape of married happiness. In winter the bouquet is more expensive, though flowers are surprisingly cheap and plentiful in England even when the snow is on the ground, so abundant are our floral supplies from the South of France and the Scilly Isles. White violets, lily of the valley, snowdrops, narcissi, are all appropriate to the bridal bouquet. Orchids are always costly. The days of the very large bridal bouquet are over. The tendency is to revert to the small round bouquet of the Victorian period, the flowers closely arranged and set into a bouquet-holder. This latter adds one more to the long list of appropriate wedding gifts. * The huge bouquet with which brides in the end of last and the beginning of the present century were burdened was not at all a graceful adjunct, for several reasons. Its bulk obscured the outline of the figure. It interfered with the pretty folds of the wedding-veil. It hid the front of the gown, often very charmingly trimmed with lace or embroidery, and its weight tired the arm of the bride, already quite tired enough with the arduous work of the previous weeks in connection with the trousseau, the correspondence with regard to presents, and the other preparations. Some of the smartest bouquets are merely sheaves of long-stalked flowers, such as lilies, roses, carnations, gladioli, and sweet peas, all white, of course. "The Chosen Leaf of Bard and Chief"
Another form is the shower, a light and delicate arrangement, carried with ease, and sometimes provided with a loop by means of which it can be slung on either wrist, leaving the hands free. Strands of smilax hang from the flowers, and white blossoms are tied in amidst the greenery. Sometimes long sprays of small-leaved golden-green brown ivy form the light cascade of these shower-bouquets. They are always tied with white satin ribbon streamers, and care must be taken not to have these too wide. Two inches and a half to three inches is the best width. Bridesmaid's bouquet of lilies of the valley, choice green and white foliage, tied silver ribbons, long trails of asparagus and lilies dropping down. Some brides have had their entire bouquet made of orange blossom. There is no lovelier flower, no foliage more beautiful than those of this hymeneal tree. The perfume, however, is apt to be rather overpowering in its luscious sweetness. 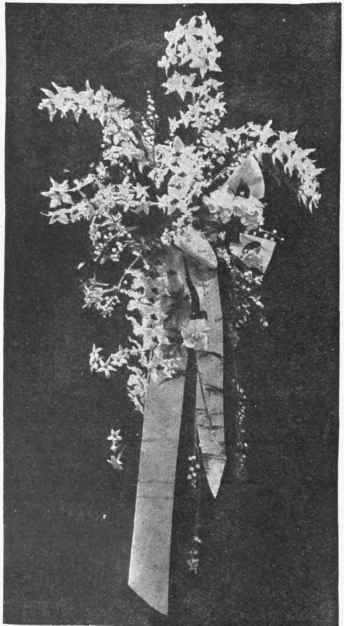 No such objection could be made to a bouquet composed entirely of white heather carried by a bride in compliment to the nationality of her husband, a Scotsman. An Irish bride, or any girl marrying an Irishman, likes to have a bit of shamrock tucked into her bouquet. The " chosen leaf of bard and chief " is too tiny to be really decorative, but it can be combined cleverly with other flowers and foliage, and yet displayed sufficiently to be recognised by all. In one case its little clinging clusters were tied at intervals to the small, pointed ivy that hung from the bouquet, the effect being happy in the extreme. Widow-brides are not supposed to carry bouquets. They sometimes have a handful of flowers, but more often wear a bunch on the bodice of the gown. But these are never orange blossom. They are always reserved for the spinster - bride. Myrtle blossom, too, is forbidden to the widow-bride, but she may have her sprig of white heather, though denied many things, including bridesmaids and pages. Her one dame d'hon-neur, or demoiselle d'honneur, may wear flowers on her dress, but custom forbids her to carry a bouquet. The bride, however agitated she may feel, must not forget to distribute sprays of her bouquet among her bridesmaids and other girl friends. There is an idea that this may lead to other weddings, just as an old superstition would persuade us that if an unmarried girl put a bit of bride-cake under her pillow she will dream of the man who is to be her future husband. But however generous the bride may be with sprays from her bouquet - and the nuptial hour is one of generous feeling - she will always keep one or two for preservation among her most cherished possessions.